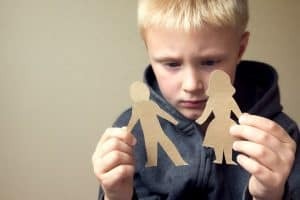 In all our years of helping clients and families, we’ve lost track of the number of people who have told us they wished they could have “stuck it out, for the sake of the children.” The truth is, yes – divorce can cause problems for your children, but in many cases, a bad marriage can harm them even more. Our goal is to protect your interests no matter what, so we wanted to take a look at both arguments today, so you can have all the information you need before you make the decision that is best for you. In an article written by psychologist Jann Gumbiner, Ph.D., divorce is bad for children of all ages, including adult children. Children, even the most intelligent of them, often believe that it is their fault when their parents get divorced. They put a lot of blame on themselves, their grades suffer, their social lives suffer, and their adult love lives suffer. After school activities might also take a hit because there is no one around to drive the child to and from the activity if the custodial parent is working and the non-custodial parent isn’t in the picture. Keep this example in mind, though, because we’re going to come back to it. The four issues listed above that Grover claims children of a bad marriage suffer from can cause lasting problems in life. Mood issues are most prevalent for children who see their parents fight often. If mood problems go untreated, the child could grow up to suffer from substance abuse, personality disorders, and other social problems. Furthermore, in Dr. Gumbiner’s example about one parent “protecting” the other, she fails to recognize one crucial problem: namely, that one parent feels the need to protect the child from the other parent’s behavior. If your spouse engages in behaviors, either physical or emotional/psychological, that puts you and your children at risk of harm, then staying together for the children may not be an option. The effects of divorce cannot compare to the effects of chronic abuse. Whether you and your spouse choose to divorce, or choose to work harder on your marriage to keep your family together, is ultimately up to you. What you should do, in either scenario, is ensure that your children are safe — both physically, and psychologically. Make sure they know they are loved, and that the decision to split (if you decide to divorce) has nothing to do with them. Furthermore, remember that while they don’t need to know every sordid detail about your marriage, being honest is always a better policy. If your children are old enough to understand what is happening, you should consider sitting down and allowing them to ask the questions they need to ask. It may be beneficial to do this in the presence of a counselor, in case your children need some additional help processing the information. Divorce can make a lasting impression on your children, but staying in a bad or abusive marriage could do irreparable harm. If you are ready to move forward, contact the Franklin divorce attorneys at the Law Offices of Adrian H. Altshuler by calling 615-412-1121, or completing our contact form. We represent clients in and around Franklin, Columbia, and Brentwood.